This is a book with a solid focus, and I feel like it accomplishes it’s goal nicely. Basically what Maya Studio Projects is about is creating environment objects and props for games (as the title implies). There are 9 chapters, and each one chooses a different object to model. McKinley is very detailed in his explanation, and really shows each and every step needed to follow along. Some of the objects modeled include walls and floors, foliage, weapons, vehicles, buildings, lamps, and a simple object animation. Supposedly there is a DVD companion, but I got the Kindle e-book and usually don’t bother with looking at the discs. 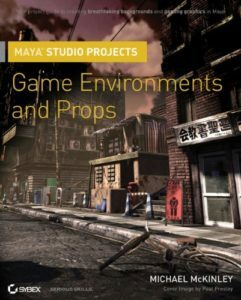 What I like most about Maya Studio Projects: Game Environments and Props by Michael McKinley is that the book is very much geared toward game artists. While pre-rendered art and game art do require the same skills, there is a slightly different thought process and flow when you are working within the limitations of a real-time game engine. The author does not assume you are using any particular engine (though Unreal is named a few times) and the techniques can be used in almost any modern engine. However, the instruction steps are very much tailored for Maya. While this is great if you want to follow along, step for step, it may make it more difficult if you use another package. Also, I typically like to just read along and sometimes I felt the author was too specific in each step, making it harder to extract the general philosophy of modeling. This can be a pro or con depending on what you are looking for. I would have also enjoyed more pictures. Sometimes as much as 10 or 12 steps were made in text alone and it can be slightly confusing without a demonstrating photo. To sum it up, this was a fine book and I learned a little bit. I would not say it was exceptional, but there was nothing grossly wrong with it. Certainly, if you are looking to create props with Maya (especially man-made objects) this is not a bad place to start. If you are using Maya LT for game development, this is a very relevant book since it (thankfully) doesn’t use really any of the features missing in the LT version. One slight disappointment, McKinley doesn’t actually show you how to make the nice art on the cover. Can’t hold that against him, though. I’d consider this a great beginner’s book, and should help to get you started with 3d game modeling.